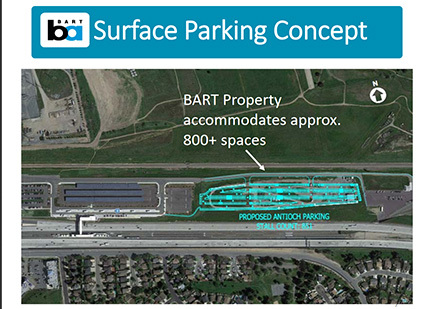 At the October 17 Contra Costa Transportation Authority meeting, the board voted to provided $5.01 million in funding that could allow Bay Area Rapid Transit to add more than 800 additional surface level parking spots at the Antioch BART Station. During the presentation by BART to CCTA, they explained the Antioch service began in May 2018 and the demand for the new service has doubled the original forecast with around 3,050 daily exits at the Antioch Station. The success of the new service has resulted in full occupancy of the parking lot by 6:00 am on weekdays. Upon completion of the added parking, the number of BART parking spots in Antioch would nearly double from the current 1,000 spots to 1,800. Currently, BART has more than 3,000 riders a day with only 1,000 spaces, BART explained twice as many riders that are driving, where original forecast 1,500 spaces. Construction could begin next summer and finish a year later with $4.3 million being provided by BART, $3.65 from MTC, and $3.25 of Measure J eBART plus $1.9 of Measure J Access Funds and $3 million from ECCRFFA. 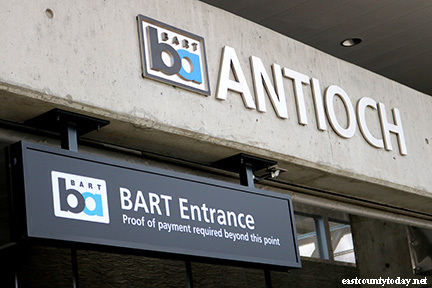 BART presented to the Board the outline of the project and had asked CCTA to appropriate $5.01 million in funds for the completion of the project to expand the project—estimated at $20,000 per space. Supervisor Karen Mitchoff noted that based on the current plan, they are still about 1,000 spaces short and asked if they were constrained by the land they have. BART Board Member Joel Keller explained by 2030 they anticipate 10,000 trips and will need 1,600 parking spots with some spots available for possible expansion, but there is no roadway at the moment over the train tracks while they are working with the city of Brentwood with the transit center to provide 1,000 parking spaces to connect with Tri Delta Transit on a straight shot bus from Brentwood to the BART station. He also noted Pittsburg is looking at a couple of hundred extra spaces around the courthouse. 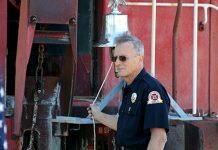 “What happened was there was a shift east so there is spaces available in Concord and Martinez has the most spaces available than any of the stations. 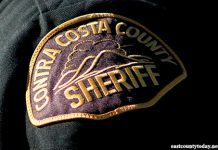 Your right, as this system continues to grow, and east county continues to grow, future parking is going to be an issue and we need to keep ahead of it as best we can,” said Keller. Oakley Councilman Kevin Romick also pointed out that besides the Brentwood transit center, Tri Delta Transit has purchased two properties for Park and Ride in Oakey and Antioch and that the land is purchased and they are looking for funding to build it which would be about another 500 parking spaces. 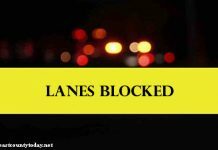 Brentwood Mayor Bob Taylor stated that Brentwood has issued 500-550 permits so that parking lot will fill up quickly and that Brentwood is working on pursuing a parking lot adjacent to a transit area for more spaces. 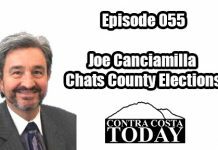 According to CCTA Executive Director Randy Iwasaki, this project is estimated $16.1 million and is BART project, but the money is being used from savings of the Highway 4 Projects along with other funding available. “The BART extension has always been an integral part of modernizing Highway 4. 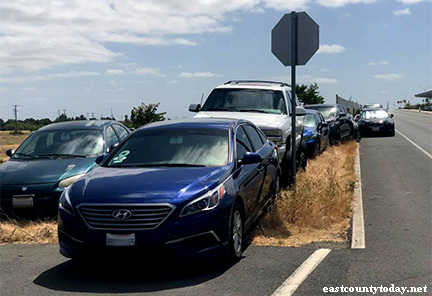 The ridership on BART’s East County rail extension has far surpassed the ridership projections, which has created a parking issue at the Hillcrest station. The appropriation of Measure J funds will, hopefully, expedite a solution to encourage more transit ridership along Highway 4. CCTA is excited to be part of the solution,” said Iwasaki. In addition to Measure J funds, funding partners include Metropolitan Transportation Commission (MTC), BART, and East Contra Costa Regional Fee and Financing Authority (ECCRFFA). The project is currently in the environmental clearance and design phase. Construction is targeted to begin in Summer of 2019 and end in Spring 2020. Build a multi-story parking structure you dummies! People out here want to Bart to work; and the people further east in the valley use this station as their hub. Think! Bite the bullet, spend a few more dollars and do the right thing, not just a band-aid. Thanks for your comments. If it were a matter of a “few more dollars,” I would agree with you that a parking structure might make more sense. However, the cost of this 800 space project is about $16.4 million or roughly $20,000 a space. Parking structures cost about $40,000 to $45,000 a parking space, adding between $16,000,000 to $20,000,000 to the cost of the project. That amount of money is not currently available from our funding partners and for the sake of our riders, we could not delay this project while we shopped around for the additional money. Thank you for your comments. In February, BART will start the Transbay Tube Earthquake Safety Project. The benefits to the region will be an acceleration of the retrofit project and minimizing the risk to BART Operations, and improving system performance and reliability. By opening one hour later, the amount of work time available to workers will increase between 43-62%. Contract costs will improve by 12% and a 25% improvement in construction time. I fought really hard for a robust bus alternative for those riders that currently begin their trip before 5:00 am. As a result, today by rail it takes 100 minutes from Antioch to SFO. Travel time on the bus alternative in February will be 104 minutes. BART is committed to reviewing the service after implementation and making adjustments, as need. Instead of pushing the morning commute by 1 hour, you could have ended the night commute by 1 hour. HYour stats regarding 43-62% will remain the SAME as well as your stats about 12% to 25%. Since you like stats so much, please give us stats of ridership per each hour for the first three hours of BART operations and the last three hours of BART operations. Before you give any numbers of ridership, please clarify if riders numbers are when people EXITS the station, NOT when they ENTER the station. (aka please don’t spin the facts/stats). Too many night workers to end commute before midnight. BART should not quit opening at 4::00 a.m, 5:27 a.m. Train is already pretty full at Concord. BART should not cut passenger service period when it should expanding service. BART numbers are always bull or change from week to week. Joel Keller has not done a good job for East County. Vote him out. I will not vote for Sean Wright again either for endorsing Joel Keller for re-election to BART Board and accomplishing nothing for Antioch so far and not putting more pressure on BART. Build a parking garage !